ICO stands for “initial coin offering,” and refers to the creation and sale of digital tokens. In an ICO, a project creates a certain amount of a digital token and sells it to the public, usually in exchange for other cryptocurrencies such as bitcoin or ether. 1) The token has an inherent benefit – it grants the holder access to a service, a say in an outcome or a share in the project’s earnings. 2) The benefit will be in increasing demand, which will push up the market price of the token. Tokens, especially those of successful sales, are usually listed on exchanges, where initial buyers can sell their holdings and new buyers can come in at any time. As a type of digital crowdfunding, token sales enable startups not only to raise funds without giving up equity, but also to bootstrap the project’s adoption by incentivizing its use by token holders. Buyers can benefit from both the access to the service that the token confers, and from its success through appreciation of the token’s price. These gains can be realized at any time (usually) by selling the tokens on an exchange. Or, buyers can show their increasing enthusiasm for the idea by purchasing more tokens in the market. The first token sales appeared in 2014, when seven projects raised a total of $30 million. The largest that year was ethereum – over 50 million ethers were created and sold to the public, raising over $18 million. 2015 was a quieter year: Seven sales raised a total of $9 million, with the largest – Augur – collecting just over $5 million. Activity started to pick up in 2016, when 43 sales – including Waves, Iconomi, Golem and Lisk – raised $256 million. Included in that total is the infamous sale of tokens in The DAO, an autonomous investment fund that aimed to encourage ethereum ecosystem development by allowing investors to vote on which projects to fund. Not long after the sale raised over $150 million, a hacker siphoned off approximately $60 million worth of ether, leading to the project’s collapse (and a hard fork of the ethereum protocol). The DAO’s failure did not deter the increasingly ebullient enthusiasm for the new asset type, and in December the first fund dedicated to token investment got significant backing from old-school venture capitalists. Along with increased attention came increased scrutiny, and concern about the legality of token sales came to a head when the U.S. Securities and Exchange Commission (SEC) put out a statement saying that, if a digital asset sold to U.S. investors had the characteristics of a security (ownership rights, an income stream or even expectation of a profit from the efforts of others), it had to abide by U.S. securities laws. At time of writing, the growth in initial coin offerings looks set to continue. As the technology matures and the market gains more experience with the concept, and as investors become more sophisticated, the quality of the tokens and the viability of the business models are likely to improve. Regulators will most likely pay more attention to token sales as the next few years unfold, perhaps even passing blanket laws – or amending existing ones – to protect investors from flimsy or fraudulent sales. Meanwhile, new types of business models will continue to emerge, fuelled by a new funding system and operating structure. The infrastructure that supports token sales will also continue to grow, with reputable advisors morphing into the “investment banks” of the sector, and new dedicated platforms increasingly enhancing the user experience. CoinDesk will keep you up-to-date on the latest developments in digital tokens and blockchain project funding. We also offer quarterly summaries in our regular State of Blockchain reports, which you can download for free. 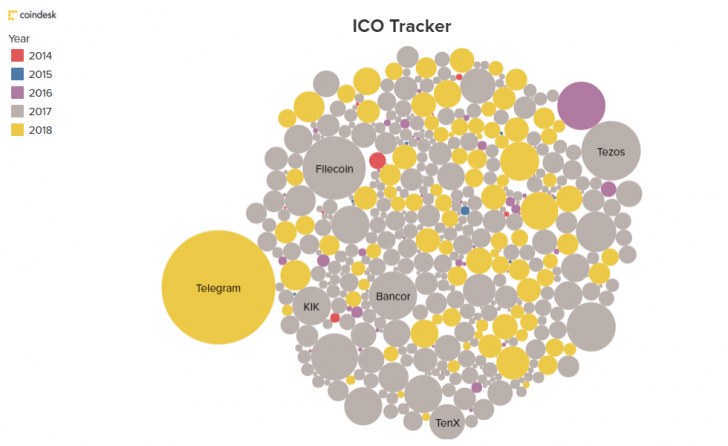 And you can keep tabs on completed ICOs with our colourful, interactive ICO tracker.